Shah compared the coming elections to the third battle of Panipat, in which Maratha forces were defeated by the army of Afghan ruler Ahmed Shah Durrani (Abdali). 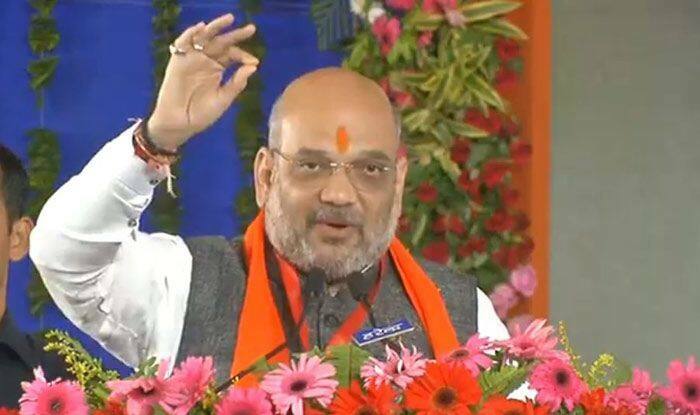 Mumbai: In a veiled warning to party’s bickering ally Shiv Sena, BJP president Amit Shah on Sunday said that if an alliance is forged, the party will ensure victory for its allies, but if it did not, the party will defeat its former allies in the upcoming Lok Sabha polls. Shah’s statement came immediately after Maharashtra Chief Minister Devendra Fadnavis set the BJP workers a target of winning 40 of the 48 Lok Sabha seats in the state. Shah and Fadnavis addressed BJP workers from Latur, Osmanabad, Hingoli and Nanded districts in Latur city Sunday. “Party workers should get rid of confusion about (prospects of) alliance (with the Shiv Sena). If the allies join us, we will ensure their win, or else will defeat them too (“patak denge”). Party workers should start preparations at every booth,” Shah said. The BJP chief said after this battle, the country was “enslaved” for 200 years. “If we win this election, our ideology will continue to rule for next 50 years. We should put in extra efforts to win this election,” Shah said. “In 2014, the BJP won 73 seats (in Uttar Pradesh). This time even if SP and BSP join hands, we will win 74 seats,” he said. The Sena and BJP had contested the 2014 polls in alliance but split up at the time of Assembly elections. The Sena joined the state government later.